Dualit is one of those brands I think we should all support: iconic designs and – as importantly – stuff that’s made right here in Britain. 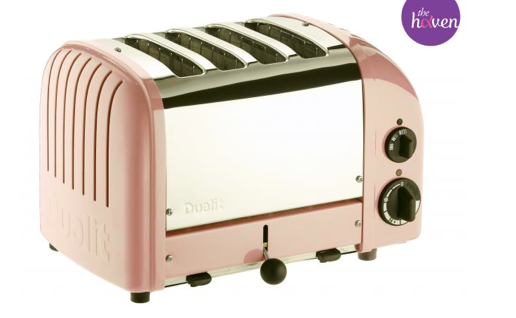 The company has just announced that they are launching a special pink edition of their classic toaster in October which is, as I’m sure lots of you know, breast cancer awareness month. Having had my own brush with breast cancer some years ago I don’t really need a special month to make me aware of it, but tie-ins like this are one way of raising money to support various worthy charities. In this case, a charity called the Haven – which has centres in London, Leeds and Hereford providing a wide range of therapies to complement the medical care patients get from the NHS – will get a £20 donation for each toaster sold. Meanwhile my other half is discovering his inner barista playing with our latest kitchen gadget – Dualit’s milk frother. Maybe the novelty will wear off, but until then I am enjoying my cappuccinos and next time the littlies are here he will be able to magic up babyccinos to amuse them. Who needs Harris and Hoole?